Online plant shop Léon & George grows roots in San Francisco's Mission District. San Francisco, CA: The team behind luxe online plant shop Léon & George wants you to meet their plants in real life. 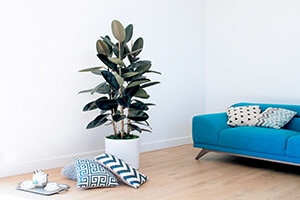 After launching as a houseplant delivery service in 2016 and offering nationwide shipping in early 2018, the company will open its first brick and mortar location in San Francisco in July. Gone are the days of buying starter plants and hauling bags of potting soil home yourself. The Silicon Valley startup boasts a stylish selection of quality indoor plant and pot sets that include lifetime plant care support. The company is one of the first plant retailers to offer a full-service experience that consumers have come to expect from today's tech-driven economy. "Our goal is to make it easier for people to get the benefits of outdoor space, without actually having any," says co-founder Nicolas Bartoli. "We want people to feel as good about selecting a houseplant as they do about other interior decor, like a new piece of furniture or art." The showroom has already built a loyal following via a series of successful spring pop-up shops. "The brick and mortar location is an opportunity for us to establish a community of plant enthusiasts," says retail manager Renée Christensen. "We're here to help people feel confident about caring for their plants for years to come."